God’s gift to those who cannot have nuts (moment of silence for this delicious treat the incredible hand is modeling). Although I can have nuts, I have a tendency to overdo it on almond butter (raise hands if you go through 1 jar a week). Recently, I’ve been enjoying cashew butter and sunflower butter. However, I’ve noticed that many of the sunflower butter brands include added sugar and it ends up being too sweet for my taste. So I wanted to make my own version that I felt better about enjoying every day. This 6-ingredient, 20-minute sunflower butter gets a serious nutritional boost from hemp seeds, flax seeds, pumpkin seeds and chia seeds! They not only add essential amino acids, protein, fiber, healthy fats, and more, but also a nutty crunch to this creamy spread. You get the idea. If you try this recipe, let us know what you think! Leave a comment, rate it, and don’t forget to tag the recipe #minimalistbaker on Instagram. Cheers, friends! Super seedy sunflower butter with chia, hemp, flax, and pumpkin seed - perfect for toast, baked goods, oats, and more! Creamy with a slight crunch, six ingredients, and vitamin and mineral-rich! If your sunflower seeds are roasted (select unsalted if possible), skip this step. Otherwise, preheat oven to 350 degrees F (176 C) and spread sunflower seeds on a baking sheet. Roast for 10-15 minutes, stirring/turning the pan occasionally, until fragrant and light golden brown. 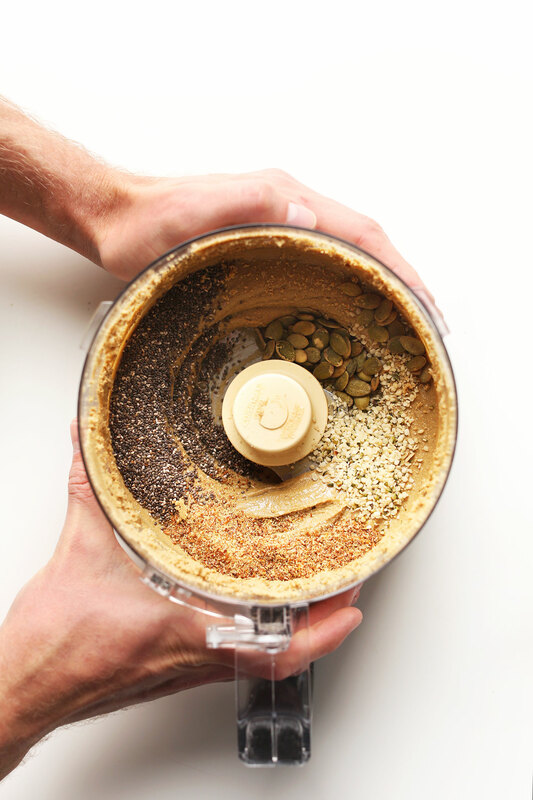 Add roasted sunflower seeds to a food processor (or high speed blender) and blend until a butter forms, scraping down sides as needed. It should take about 5-7 minutes. Resist the urge to add any additional oil (and especially not water, as it will cause the butter to seize up). Add salt, chia seeds, flax seed, hemp seed, and pumpkin seeds and mix/pulse to combine. Taste and adjust flavor as needed, adding more salt, or a bit of sweetener of choice if desired (avoid using liquid sweeteners, as they can cause the butter to seize up and lose its form). This spread is perfect for toast, baked goods, waffles, pancakes and more! Store at room temperature for 1-2 weeks, or in the refrigerator up to 1 month! I just made this today. I usually consume nut butters a lot so I just avoid buying them. I did almond butter a couple of weeks ago it was great but decided to try sunflour seeds this time. I didn’t have hemp seeds so I didn’t use it, not sure how much it’d influence the taste. I followed the recipe but I think I would prefer raw seeds, instead of roasted. The roasted seeds gives it a very strong flavour and I’d like it to be more gentle. It took a while to get it done since the recipe does not add any other oils, which usually speeds up the process. What does it go well with? It is quite strong so I am not sure what is the best way to use it, any suggestions? Hi Reis, sorry to hear the flavor was too strong for you. You could try raw sunflower seeds or another suggestion for making the flavor more mild would be to mix it with another nut/seed butter such as almond butter. We like to serve it with toast, baked goods, waffles, and pancakes. Hope that helps! I’ve made this before and it’s SO good! I’m wondering if it can be frozen? The amount is too much for me to get through in a month. Hi Carrie, we haven’t tried that, but think it could work! If you give it a try, we would love to hear how it works! Thank you, I’ll try it and let you know! I tried freezing this recipe and it’s delicious. Once thawed, no change at all. I do love this seedy sunflower butter! Only thing I eliminate are the chia seeds. Those buggers get stuck in my teeth, so not attractive — ha, ha! Thank you for all your delicious low ingredient and quick to make recipes. I’m been a fan for years. Didn’t read the instructions fully and added a little maple syrup as sweetener, and now the butter has seized. 😕 Is there any way to fix this? I made SunButter for the first time and turned out good. I put it in the fridge and went back later to use it and it wasn’t creamy. It got more solid. Is there anything I can do to fix it? I’ve just made this as I needed an alternative to peanut butter to add to my overnight oats – it’s fantastic! Delicious with carrot sticks. Thank you! Glad to hear that, Amy! You could just substitute with more chia and hemp seeds! I love this recipe, it’s wonderful and I thank you so much. Hi Laura! While we cannot offer medical advice as we are not medical professionals, we recommend you follow the advice of your doctor and seek their advice. I just made this in my Vitamix. I let it run till a smooth ‘butter’ formed. It got quite hot. Even while hot it was still too thick for me so I added about a tbsp of macadamia nut oil. This got it to a nice consistency for me which I’m sure will get thicker as it cools. The taste was quite nice and I like the addition of the other seeds. I added a bit of coconut sugar to go give it just a hint of sweetness. I just found out that under ZERO CIRCUMSTANCES am I ever to eat any nuts, peanuts, or–this is where my heart breaks–TAHINI ever again. I’ve also been denied tofu and eggs and I’m kind of at the end of my rope. Now I think I see the light at the end of the tunnel… I LOVE sunnies AND pumpkin seeds, and can easily see replacing my once-a-week hummus routine with a twice-a-month butter routine! I just hope my cheapo Osterizer holds up. ? Kara-No tahini, nuts or eggs here anymore either. I found this recipe and substitute sunflower butter for the peanut butter. It’s truly the best hummus I’ve ever had. Can I use date sugar for a little sweetness? Hi Madeline! We haven’t tried it but it should work! I live in France where these sort of products can be difficult to find. So I was very pleased to find this recipe that was very simple to follow. It was a good job that there was a warning not to be tempted to add extra oil as it did seem to take quite a while to go beyond the ‘crumb’ stage. I used my fairly small food processor. Keeping the faith, I found that clumps started to form and it was only 2 or 3 seconds between sessions of scraping it down. After a few time it made a ball and I was tempted to think it was there. Glad I persevered when, after 3 or 4 more goes, it became more of a smooth paste. I forgot to taste for salt before putting it in jars and think I may have liked a little more but this is for my grandchildren so better under salted than over! I tried this but didn’t have much luck. I roasted my sunflower seeds and then put them in the food processor. Required constant attention to keep pushing the mix into the blades. Ater 20 min it finally turned to butter but now it has a burnt taste to it…I’m assuming from how long it was in the processor. For the small amount of sugar in sunbutter, I’ll buy it from now on. Just made this recipe. So delicious!!! Don’t want to take nut butters to school since have students with allergies. This is just as good. Didn’t like the store brands due to other additives!! This will be a staple for me!! Is there a substitute for hemp seeds? I am severely allergic to hemp and anything closely related to hemp (pot). Can I just omit or add more flax? Walked back in the kitchen to make another and he asked for more!! Love the warmth of it right after being processed. So satisfying and energizing!! Dana you are changing our lives!! I tried this recipe yesterday and have my sun butter in a cute mason jar now. I had some on my toast this morning with honey! Yum. It’s also delicious with apples or spread on crackers. At first I really did not think the recipe was going to work. Be patient! Keep blending! Eventually it turned into a smooth consistency. I wish I had waited a bit longer past the smooth phase, to really make sure it was a butter as opposed to a paste. I doubled on hemp and chia, which may have changed the consistency. I personally will not use the pumpkin seeds again; I don’t like the slight greenish/gray colour it made my end product. There might be something to put in to counteract the natural gray colour of the sunflower seeds. If you plan on eating with honey there’s no need for any more sweetener! So. I too have an almond butter and peanut butter OBSESSION. I can eat so much of both of them like CRAYYYYYYYYY. I definitely need to try sun butter again because I remember how amazing it was the first time! I’m so glad you said “resist the urge to add oil” because it was a strong urge for quite awhile. My batch took about 15 minutes to get to the miraculous stage of dramatically turning from meal to GOSH! BUTTER! Thanks. I ate a spoonful (OK two. Alright, three) plain. Also, is roasted the sunflower seeds totally necessary? can we use raw? As an avid love of ALL nut butters, I CANNOT wait to try this… today!! P.S. – I love, love, love all your photos! I’m going on a trip this summer, and really want to bring a good camera to capture everything :) what camera do you recommend buying? Oooh I am going to try this as a substitute for almond butter in your 5 Ingredient Granola Bar recipe. Thanks for this awesome recipe! I whipped it up last night. It tasted okay when I was tasting it straight from the food processor, but this morning, when I had it on toast, fuh-get about it! It tastes amazing! I added a little sweetener (a little brown rice syrup…even though the recipe recommends against liquid sweetener!). The consistency is amazing and it spreads on toast like butter! Thanks!!! Whoop! Thanks for sharing, Amy! 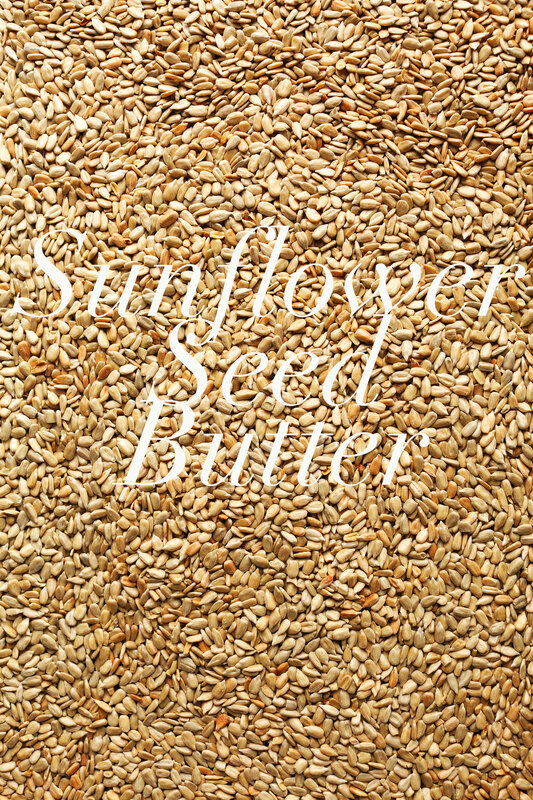 Can sun flower butter be substituted for almond butter? Also can sunflour be substituted for almond flour? In most recipes, yes to both! There are so many nut-free school districts around where I work, I could probably sell this to a million people. Love the recipes that you share! I’d like to try this recipe but don’t have hemp seeds. Can I omit or substitute with something else? I made this today and ran into the same problem. I noticed the seeds were very hot since I poured them in straight from the oven so I let them rest. Then I would blend them for a minute and then go do something else for a minute. Finally it formed a giant ball that spun around in the processor. It was still very chalky though. I continued to process it for another few minutes and magically it thinned out and became a nut/seed butter. I think it would help to have pictures of the Seeds throughout the process. There may be a post in the past that has this. I have a brand new pretty powerful food processor so that may have something to do with your bad luck as well. Once I added the additional nuts I sort of wished I blended mine even more!! Someone said it tasted better the second day so I’ll have to wait and see! Yippee. Hi ladies! this is just part of the process. You have to let it keep blending. It might be that your food processor/blender isn’t high speed /quality enough. Hope that helps! Old post I know…if you are self roasting I would put them in hot and blend. It can be a process to scrape down the sides occasionally but the heat helps the process in my experience. I do this for every nut butter I make. Gah! Cannot wait to make this! I, too, find some Sunflower Butter brands to be too sweet and this is just right up my alley and to also incorporate, chia, flax , hemp, and pumpkin….nom, nom, nom. Never tried this, but just the name did it for me. Mid winter where I am and anything with sun in it sounds good! Thanks for all the great recipes and all the lovely photo’s. I love to save my recipes to Evernote for ease of reference, and your site makes it just so easy to do it. So a big thanks for that, too. 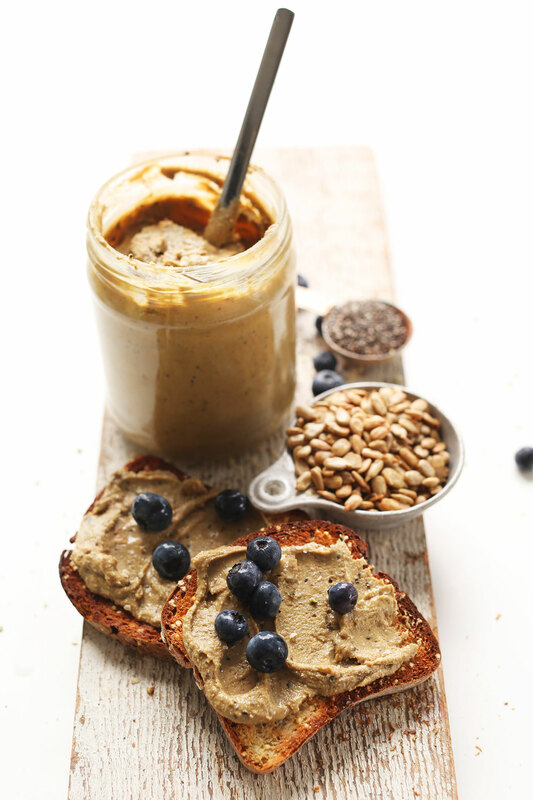 I’ve never tried sunflower seed butter, but it looks really good! Looks delicious! Perfect for use in lunches for my toddler since the preschool is nut-free. Are the pumpkin seeds crucial, or could they be omitted/replaced? I only ask because I think I have all of the ingredients except the pumpkin seeds! Just made this last night (w/out pumpkin seeds) and wanted to leave a rating. So delicious! Love the extra seeds in there :). Thanks for the awesome recipe! I love the addition of little flecks of chia, flax, and hemp, that would be a delicious textural addition to any nut/seed butter! 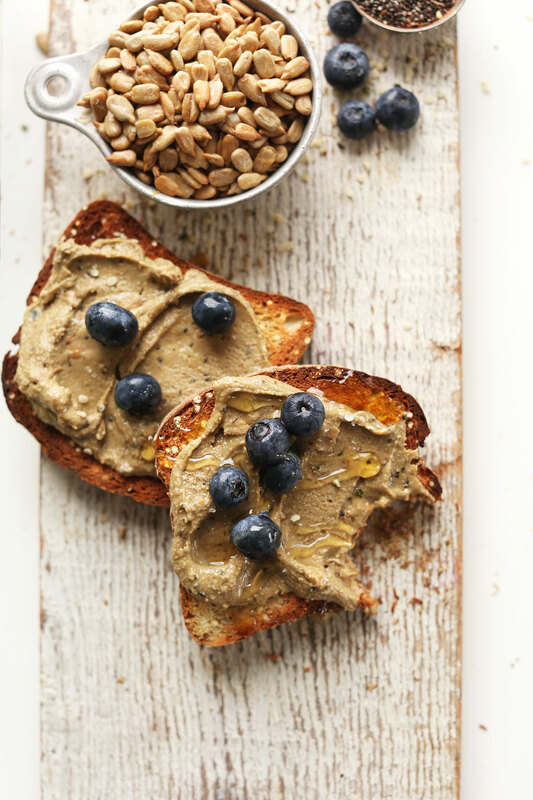 I just want to grab those slices of toast right now for a snack :) And anyone who can keep a jar of almond butter for longer than a week has earned my full respect, especially if it’s sweetened! My favorite sunflower seed butter just got recalled, which means that this was clearly meant to be. I can’t wait to try it! I can easily eat a jar in a week, but how long will this last in the fridge if I manage to control myself? It’s so weird how you publish recipes according to what’s in my pantry! Just last night, I made your vegan parmesan cheese with sunflower seeds (which turned out GREAT, by the way). And now here’s something for me to do with the rest of the seeds! Thank you! Also, almond butter? Yeah, TOO addictive! I recently went nut-free and have become OBSESSED with sunbutter! 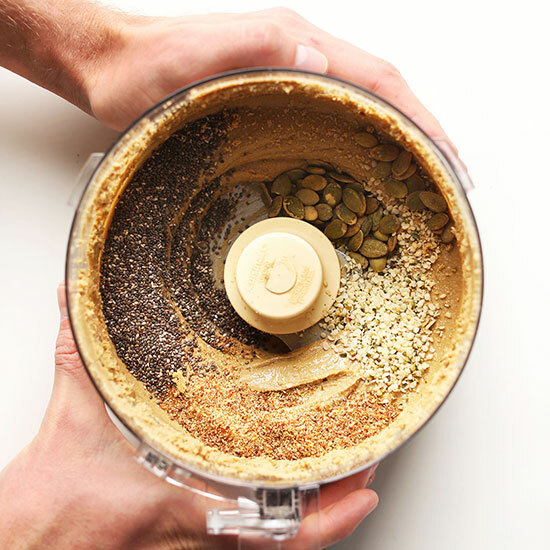 LOVE the additions of chia/flax/hemp/pumpkin seeds in this version – can’t wait to try! I can’t wait to try this! I was nut-free until I was 19 (yay for outgrowing allergies! ), so sunflower seed butter will always hold a special place in my heart. This looks SO yummy! I didn’t know you could outgrow allergies! I hope that’s my case. Anyhow, I’ve been told to try this by my sister….hmmmm. I’m going with your recipe over hers though, don’t tell…okay? Some times people grow out of allergies but not always. My son had an allergy to eggs, peanuts and wheat. He is no longer allergic to eggs but still allergic to wheat and peanut, however the severity of the allergies have reduced. I am 50 and had a wheat allergy all my life.